This article will describe how to connect your Thinkific account to Interact apps. As of November 2018, the Thinkific "Pro" plans or above are required for Interact to communicate to Thinkific servers. "Free" and "Basic" plans on Thinkific do not have this ability. Step 1: Login to your Thinkific account and navigate to Advanced Settings in the left sidebar. Step 2: Click on the API section found at the bottom of the page to expand the menu. 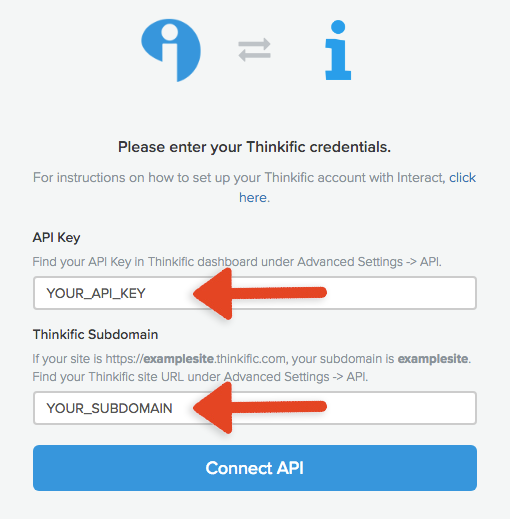 Step 3: In this section, you will find your Thinkific API Key and Subdomain. These are required for the next setup steps. 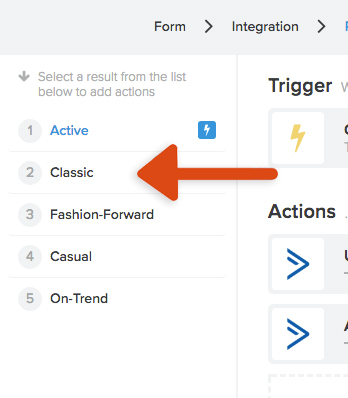 Step 1: In the Interact app builder, under "Connect your email list", choose Thinkific from the list of integrations. 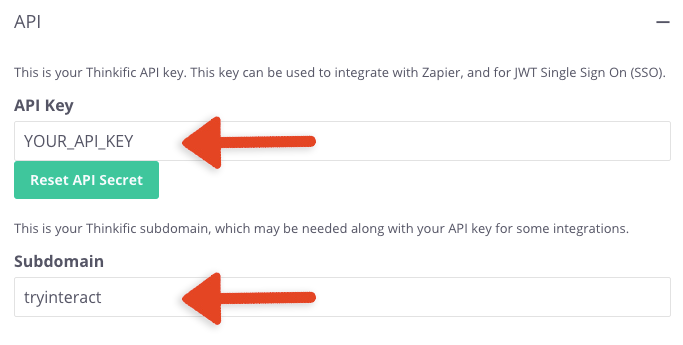 Step 2: Copy and paste your Thinkific API Key and Subdomain and click Connect API. 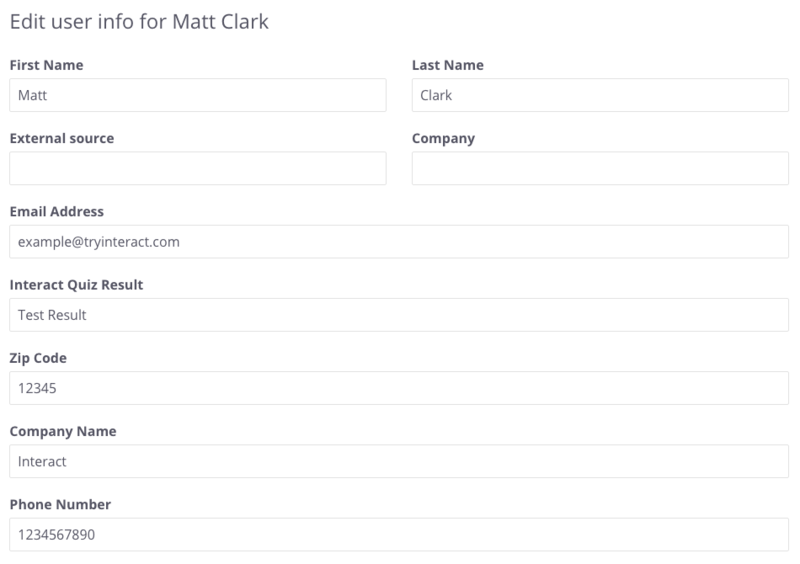 Update Custom Sign Up Field: Choose an Thinkific custom sign up field from the dropdown to update the custom sign up field for new contacts with a specific value. The value will auto-populate with the trigger name, but you can customize this with any value you want. Example: For a quiz result trigger, you could choose the Thinkific custom sign up field "Quiz Result Title" from the dropdown and populate the field with the quiz result title for your quiz. Step 1: You will have the option to send Site Welcome Email to newly created users. By default Thinkific disables these emails, but you can turn it on by checking the box shown below. Step 2: For all other fields, choose one custom sign up field from the dropdown that you would like to populate with the form value. Example: mapping Company Name to "Custom Field 1" will populate the value inputted for Company Name into the Thinkific custom sign up field "Custom Field 1". What Thinkific plan type do I need? Will existing Thinkific users be updated? No, currently our Thinkific integration will only add new users if they do not already exist in your Thinkific users list. What will a new contact look like in Thinkific?